ROSEMARY HARRIS: Okay, Julia asked me for the Strawberry/Blueberry cream cake recipe and I thought some of you might like it too. This cake is amazing and ridiculously easy to make. It will raise you to the level of domestic goddess in the eyes of your friends and family. I made it once for a July 4th party and got in the habit of sprinkling blueberries on the top too otherwise it's a Martha Stewart recipe. I've also added blackberries or whatever berries looked good in the market that day. One tip..in between the layers..it looks nice if all of the strawberry tips are pointing out. Toothpicks or bamboo skewers help to get the berries exactly where you want them. Also the weight of the top layer will squish the cream out which looks good but not when too much comes out. Neurotic..? 1.Preheat oven to 350 degrees. Butter bottom of an 8-inch round cake pan, and line with parchment paper. Butter and flour paper and sides. In a medium bowl, whisk together flour, baking powder, and salt; set aside. 2.Using an electric mixer on high speed, beat butter and 1/2 cup sugar in a large bowl until light and fluffy. Add eggs and yolks, one at a time, beating well after each addition. Beat in vanilla. With mixer on low, alternately add flour mixture in 3 parts and milk in 2, beginning and ending with flour mixture; mix just until combined. Spread batter in prepared pan. 3.Bake until a toothpick inserted in center of cake comes out clean, 30 to 35 minutes. Cool in pan 10 minutes; invert onto a wire rack to cool completely. Using a serrated knife, split cake in half horizontally; place bottom half, cut side up, on a serving plate. 4.Make topping: In a large bowl, combine strawberries and 1/4 cup sugar; set aside. Place 2 tablespoons cold water in a small saucepan, and sprinkle with gelatin; let soften 5 minutes. Place saucepan over very low heat, and stir until gelatin is dissolved. Remove from heat; let cool. 5.Using an electric mixer, beat cream and remaining 1/4 cup sugar in a large bowl until very soft peaks form. Continue to beat, and gradually add gelatin mixture; beat until soft peaks form. 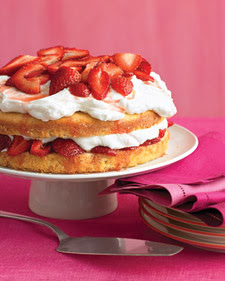 6.Arrange half of strawberries over bottom cake layer; top with half of whipped cream, leaving a 1-inch border. Cover with top half of cake, cut side down. Top cake with remaining whipped cream, leaving a 1-inch border. Refrigerate cake and remaining strawberries separately, at least 1 hour (or up to 1 day). Just before serving, spoon strawberries over cake. Oh, YUM! If it wasn't so hot here, I'd make this in a second. We've sworn off using our oven until the temps drop a little below 100--104, 105 on the way this week--. Even though it's a good, well insulated oven, it still heats up the already unbearably hot kitchen. Sigh. But thanks for posting the photo for me to drool over, Ro . . .
Make that two. Going to the kitchen now. I just happen to have strawberries in the fridge. Oh and 75 tomatoes on the counter. Gotta make gazapacho too. Hope I spelled that right. 75 tomatoes...I'm beyond jealous. If we're lucky we'll be harvesting the $64 tomato in a month or so. Where do you live and what are you using for fertilizer?? Yikes: "Toothpicks or bamboo skewers help to get the berries exactly where you want them." Who knew?! Rosemary, this is a side of you I'd never have guessed! I'm making this cake. Soon. I'm not a fan of icing, so I love this type of cake. It's up to 129 tomatoes in three days. They are all coming in at one time. We just send two neighbors some. Never had this many before but then my herbs pots on the back porch look like a huge green jungle and I've made over 25 meals of pesto already this summer. I'm running out of freezer space. Where do we live? The Garden State New Jersey. Honestly, we've never had our plants grow like this year and have no clue why. Anyone know if you can jar gazpacho? I tried freezing it and didn't like it.